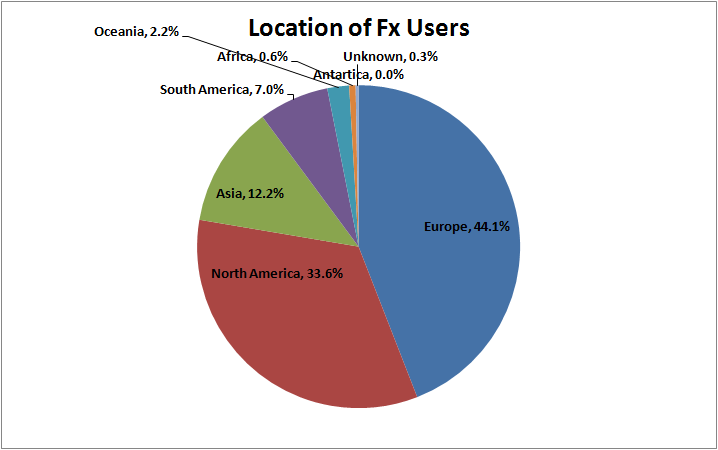 We’ve previously talked quite a bit about the international landscape that describes Firefox adoption and usage. See here and here, along with this old post from Schrep. Today, Jane asked me a relatively simple question related to Firefox usage in Europe. Within a minute, I found the answer to her question creating the pie chart below. In the past, I’ve generally focused on usage patterns by country, but I found this simple view of the data much more eye opening than previous analyses. We previously highlighted the interactive Treemap below showcasing internet population and penetration by both region and country. Asia appears to represent about 40% of the global internet population, but it isn’t as nearly well represented in the Firefox chart above (12%). Clearly, there’s much more work for us to do here in the future (a good thing!). I know Firefox supports multiple languages, but are all the Mozilla web resources available in Chinese for example? A large percentage of Asian internet use is through internet cafes. Is Firefox being used in these cafes, and is accessing Firefox as direct as accessing IE from a computer in an internet cafe? So assuming that there are roughly 200 million active users of Firefox, this means that there are roughly 88.2 million active users of Firefox in Europe. Am I right? This is amazing statistic. %44 of firefox usage in Europe. I’m in Turkey but only webmasters use firefox. EU supports firefox like folks. Turkey, Middle East and South Africa must be included in Europe’s share as they are using the same european backbone and internet infrastructure.